Buyers are in a position to heavily negotiate prices in this market. Over the past 12 weeks I have helped 7 buyers purchase property, and when there were no other offers on the home, or if it was on the market for longer than 30 days, or if it didn’t make a phenomenal first impression, my clients got amazing deals. Two of my clients purchased property which appraised for higher than they paid (instant equity). Knowing how to negotiate is more important now as compared to prior years because sellers don’t just want the highest price. They want the buyer who will close the transaction, and the better you can display confidence in closing, the higher the chances your offer will be accepted. Conversely, while representing sellers, it is important to know how to make buyers fight for your property amongst themselves. When this is achieved you are assured that you have obtained the highest price and the greatest likelihood your buyer will close the deal. 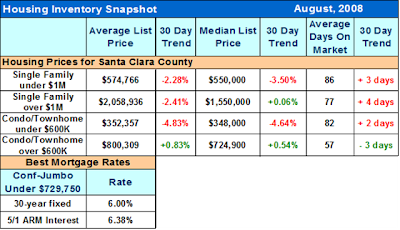 The housing stats I’ve reviewed and interest rates below are showing a market trend in the direction of stabilization. Where it will go next nobody can know for sure, but if you are purchasing for the long term, now might be a great time to make that move and get in on the trend early before it fully develops. Enjoy your weekend, and if you know of a friend, coworker, family member or stranger who really wants to buy a piece of property and needs some motivation, or accountability, let me know. I’ll be sure to help them get what they want.